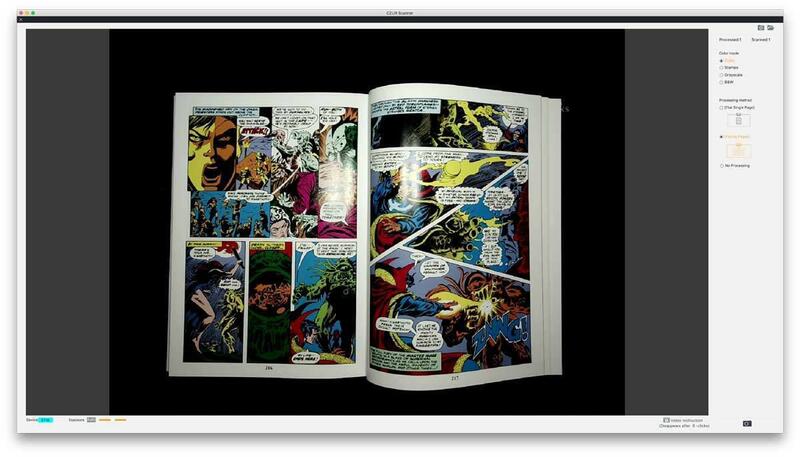 A smart scanner designed to capture books, magazines, and pages from other bound media up to A3 size in under 1.5 seconds with advanced automatic image enhancement, OCR, and curve distortion flattening. 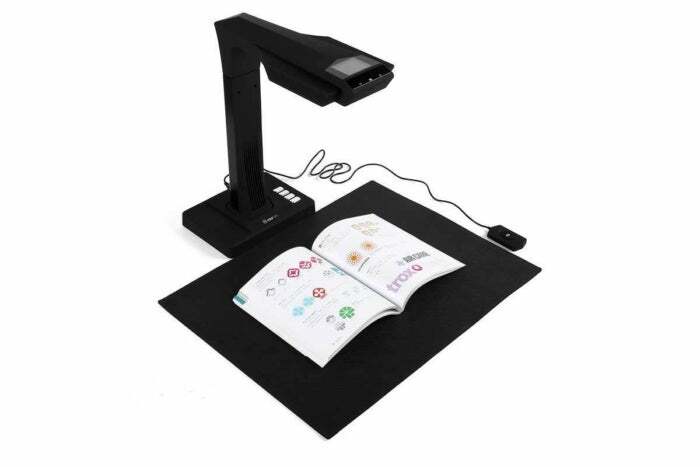 Unlike flatbed scanner where documents are placed face-down on a glass bed with a moving scanner element, the Czur ET16 ($399; available on Amazon) features a 16-megapixel Sony CMOS HD camera sensor mounted atop an upright 39-centimeter stand. Books, artwork, or even small physical objects are placed underneath the camera on an included black mat, which helps with document edge detection. The camera head includes a small 2.4-inch TFT display used to position documents prior to scanning, as well as a built-in lamp with two illumination. This works well for paper with a matte finish, but anything with a glossier surface should be scanned with the built-in lamp off, preferably using an external lighting source positioned at each side for best results. 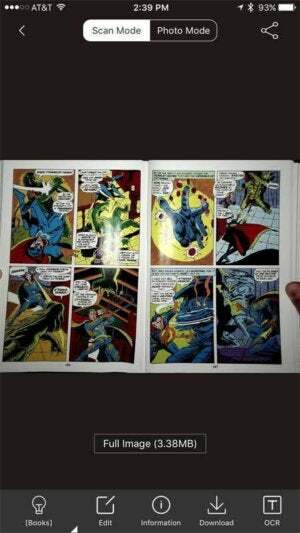 One benefit of an overhead scanner is the ability to capture both pages of an open book at the same time. The maximum width is A3, roughly the size of two letter-sized pages placed lengthwise. Best of all, you won’t need to remove staples or pages from a bound book, and documents lie face-up for easy access. Scanning is impressively fast, taking less than 1.5 seconds. The process is also noise-free. A trio of red lights briefly flash across the document mat, along with a red light on the scanner head. When the lights go off, the scan is finished. Czur thoughtfully includes several time-saving accessories in the package, such as a wired foot pedal and remote switch for scanning without sitting at the computer, as well as rubber fingertip gloves for turning pages between scans. The Czur Scanner for Mac software gets the job done, but barely. While the ET16 hardware is well-constructed and easy to use, the Czur Scanner software for Mac is clearly a work in progress. Version 17.1.0215.3 lacks some of the luxuries of its Windows counterpart, such as the ability to zoom in before scanning, and Wi-Fi connectivity with direct upload to Czur Cloud, a feature offered on the otherwise barebones iPhone app. Czur Scanner for Mac does offer a few clever enhancements, such as automatically cropping page edges and flattening curve distortion from bound documents. Scanned images can be processed as single or facing pages and exported to Word, Excel, or PDF format, with or without optical character recognition; TIFF format is also available, but only in Batch mode. The free Czur Cloud app lets the iPhone get in on the fun, but the features are even more barebones than on the Mac. The Mac version is technically still beta software, and it shows. Aside from missing features, the user interface is a no-frills affair that lacks the usual macOS polish. For example, you can’t resize the window, and quitting the application can only be done by clicking the red close button in the toolbar. There are no menu options available, aside from a shortcut to the company’s website. The software is also a processor hog. In Scan mode, Czur Scanner consistently consumes over 200 percent of my 27-inch iMac 5K’s CPU time, causing the fans to ramp up even when not in use. On the plus side, the image quality is good, sporting a maximum resolution of 4608 x 3456. One downside: The software natively saves in JPEG format, so scanning at 300 dpi with Best quality is recommended. Czur delivers capable, well-made hardware with the ET16, but the underpowered Mac software threatens to derail the utility of this large-format book scanner.